When Punch Imlach was building the Leafs into a legitimate Cup contender in the late 1950s, he believed they were one big centerman away from being able to compete with the Montreal Canadiens. He went big-game hunting. The man he ended up with was a defenseman- who Imlach turned into a center. 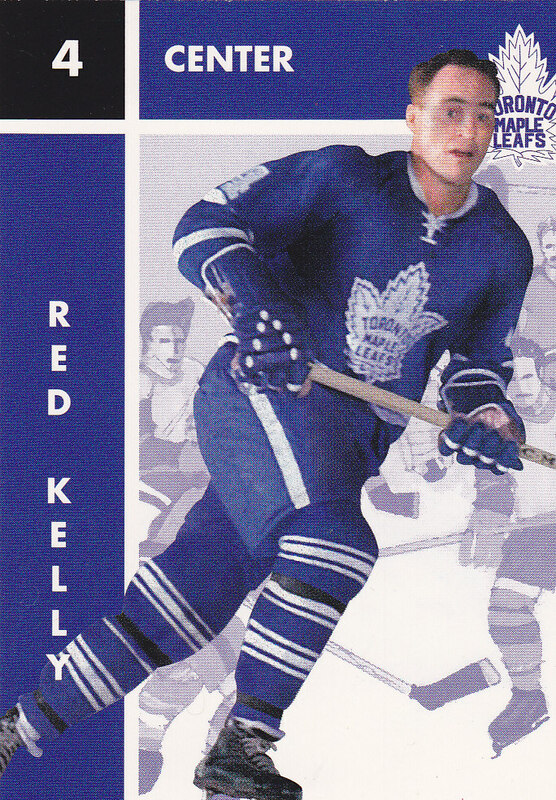 His name was Red Kelly. Kelly I remember well because when I was very young, 5-6 years old, he was a star with the Red Wings and I lived right across from Detroit. Other than Gordie Howe and the then already departed Ted Lindsay, Kelly was probably the biggest ‘name’ on the Red Wing roster. Kelly had helped the Wings win 4 Stanley Cups in the early-to-mid-1950s. He won the Lady Byng Trophy several times, and was named best defenseman on another occasion. Offensively, he was probably the best the NHL had ever seen. Long before Bobby Orr came on the scene and changed the way many defensemen played their position, Kelly scored 15 or more goals 7 seasons in a row at one point in his career—staggering numbers for a defenseman in those days. But by part-way through the 1959-’60 season he had worn out his welcome in Detroit. Crusty General Manager Jack Adams tried to trade Kelly to the Rangers, but Kelly didn’t want to go and “retired” rather than accept the move. Imlach and his assistant, King Clancy, were given permission to speak with him, and convinced him that Toronto would be a good place to play. So Adams traded Kelly to the Leafs for a young defenseman with potential, Marc Reaume. Imlach immediately turned the veteran rearguard into a center. Why? Punch felt Kelly had the skills to play head-to-head with Montreal’s big Jean Beliveau, who the Leafs couldn’t contain. 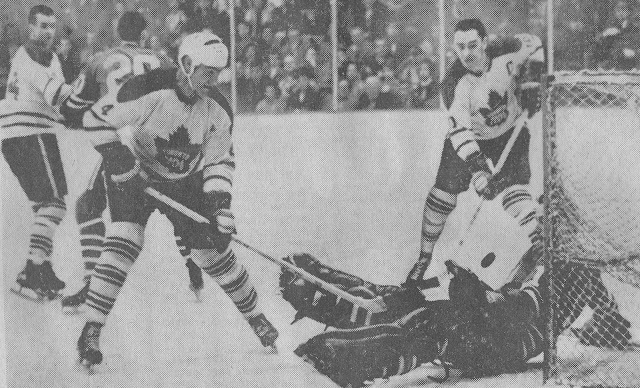 Toronto made it to the finals against Montreal again in the spring of 1960, the spring after the trade was made. Kelly contributed in the playoffs but Montreal was still too strong and captured their fifth Cup in a row. Leaf aficionados know that Toronto went on to win three Cups in succession, the last in 1964. After two subsequent mediocre seasons, the team was aging in many areas. Kelly was among those on his last legs. When the Leafs, despite a pretty lousy regular season, surprised their fans and got past Chicago in the 1967 semi-finals, few observers gave Toronto and their old guard—Kelly, Bower, Sawchuk, Pronovost, Stanley, Horton, Armstrong—much of a chance of success against the then two-time defending champions from Montreal. But amazingly, by game 6 at Maple Leaf Gardens, Toronto held a 3-2 lead in games. The contest was scoreless well into the second period. But as though on cue in what turned out to be his final game in the NHL, Kelly made a rush into the Montreal zone, crossed the blueline, pulled up suddenly and unleashed a high wrist shot which Hab goalie Gump Worsley couldn’t control. Winger Ronnie Ellis drove to the net, jumped on the loose puck and knocked in the first goal of the game—Kelly drawing a well-deserved assist. Kelly was also part of the old guard—Horton, Stanley, Armstrong, Pulford and Kelly, with Sawchuk in goal—that Imlach intentionally had out on the ice in the final minute, with Montreal down by a goal and Worsley pulled for an extra attacker. After Stanley scrambled the draw against Beliveau, Kelly jumped on the loose puck and made the play to get the puck to Pulford who sent a long pass to Armstrong, who in turn put the puck in the empty net—to clinch the last Cup Leaf fans have experienced. In Detroit, Kelly was known as a talented “rushing” defenseman. I’ll always remember Kelly’s last successful rush, which led to Ellis’ big goal in the decisive Game 6 and ultimately, a Stanley Cup.